There's no place to hide between the stars Requiem Of The Damned - Shadowbearer can find you everywhere! Calling out to the depths of anguish, the unexpected adoption of the universe that wishes to The Cancelling of Light intro gives the music for our recognition. To the Stars it's hard to live without light in the realm of dusk. Darkness envelops all around with the its shakles. You can't consider the advantages and disadvantages - it can't be seen, you can recognize just one thing - the Death only! Title track starts with the powerful rush, that tries to break free all of the fiends of darkness from the light enslavement. Shadowbearer stubbornly and persistently goes to his goal, pure vocals leading the narration of his challenging and significant deeds. Then pacified respite and repose of the story of the deeds precede the guitar solo, and this character and then administers its fate, that crowns by the growling vocals. Gloomy melodies in The IV Lines ascend to the stars, in free space twisting clean vocals and growling in a wonderful ornament. These motifs purify the soul and disperse sadness and grief. Clean vocals monologue opens the gates for The Blood, It Binds Us. Then the melody filled with the power and fury, growl supports the emotional impulses of clean vocals, combined into a single aspiration with him. Beautiful, pure from spirit to heart melody completes that artwork! 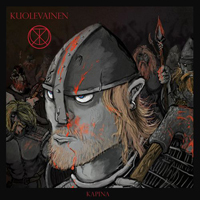 In a world a lot you can deny or accept, so Kuolevainen - Kapina will indicate - what you can't understand! The viscous, oppressive sounds guide Kapinaan the next course, where vocals combine screaming and growling in the single voice, untill the crowd chants adds their support to their story. Then guitars takes the main motifs for their strings to calm the track to the end. Motive does not leave the a major role, can't escape from the foreground Voiton Yo, mystical fairies with its mysterious chants surrounds the saga from all sides! The tale told by the fire at the camp marks Mietteita Pimeassa with its thoughtful narration. Epic saga Ei Tanne Kukaan Jaa penetrates in the depths of the mind with its sounds, raising bygone values to the top of consciousness. Then story speeds for a bit to finish the tale with the powerfull slash of sense. Thoughtful retelling of the ancient legends Vihollisen Porteilla entertaining supplemented by a powerful ballad, raising the old age in the annals of immortal human values. A retelling of legends and chronicles around the campfire Vereen Ajettu Maa complements with cries of the wounded and the noise of the rain. The wounded screaming, being at the crossroads of the world of the living and the dead, keyboards passages end fairies chants introducing the Maille Kaukaisille, instrumental saga 'till the final narration of clean vocals with screaming inclusions. And the story ends with the calm sounds of guitars strings.